The lead designer of the new SimCity says the game will be an "internet-dependent experience," so if you're not connected, you don't get to play. The new SimCity looks awfully sweet. A lot has happened in the decade that's passed since SimCity 4 and the new game looks set to take advantage of that, with fantastic visuals and a far deeper simulation of a living, breathing city than has ever before been possible. But with the good comes the bad and that means you'll need a full-time connection to the internet in order to play. The new game will be "the first truly multiplayer SimCity," Lead Producer Kip Katsarelis said earlier this month, with interconnected cities creating a greater "SimCity world" that will be impacted and influenced by individual, city-level decisions. That sounds pretty fantastic; the problem is that players will be forced to be a part of this world whether they want to or not. The game will be an "internet-dependent experience," Lead Designer Stone Librande told Joystiq, which means that players will need to be connected to Origin when they play, even if the game was purchased elsewhere. 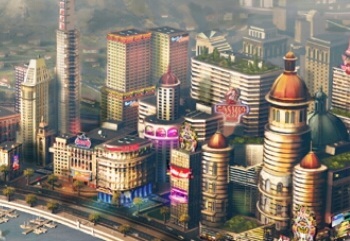 The need for an always-on connection is necessitated by SimCity's "emphasis on multiplayer and regional impact, and the use of a global economy that all players can influence." But more relevant to a lot of gamers is the obvious DRM aspect. No internet connection? No play. To be clear, this isn't the same as the usual quickie call home to Origin that drives so many people to distraction; that's not really a big deal, relatively speaking, since it's exactly the same thing Steam does and nobody seems to have a problem with that. What makes this particularly onerous is that the connection has to be on all the time, so if you're traveling, living in an area with crappy service or just plain don't want to be connected to the internet all the time, you're out of luck. EA Maxis Creative Director Ocean Quigley also revealed that SimCity won't support mods at launch, although it's a possibility in the future. "After we ship, we'll make decisions about how we can and when exactly we'll support mods. But it's worth pointing out that the reason people are still playing SimCity 4 almost ten years later is because the modding community essentially re-created it and filled it with new content and fixed bugs and made it as much of a hobby as it is a game," he said. "We're very cognizant of that - we're not idiots." How about an offline, single-player mode while you're at it? That'd be swell. The PC-exclusive SimCity is expected to come out sometime next year. UPDATE: Electronic Arts has clarified SimCity's online requirements, saying that the game won't actually require an always-on connection. "You will have to register an Origin account in order to play, and yes, you must be online at all times while playing in order to start playing," according to Gamespy. "EA has confirmed that you will not be kicked out if your connection is interrupted." That changes things pretty dramatically. I'm still not a fan of the mandatory "phone home" business and I think people on the fence should insist on getting the full DRM low-down before committing, but a Steam-style online check is a big improvement over DRM that gives you the boot if you get the boot.